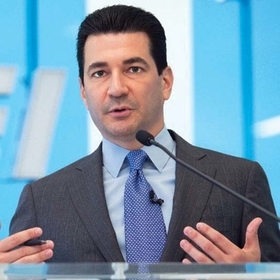 Food and Drug Administration Commissioner Dr. Scott Gottlieb said Thursday that the agency is considering regulating digital tools that are used to encourage prescription medication adherence, potentially as part of a drug review process. Approximately half of the 3.2 billion annual prescriptions dispensed in the United States are not taken as prescribed, according to the Clinical Decision Support Coalition, which has pushed the FDA to consider regulating digital medication adherence products for years. Pharmaceutical companies have partnered with digital health product developers to create tools that can be packaged around pharmaceutical use and encourage greater adherence, according to the coalition. That regulation push has gained traction with the agency, and Gottlieb said the FDA wants to establish a framework so it can review digital adherence tools as part of the drug review process. "There's a wide variety of ways in which apps and software can enhance healthcare, and our mission at the FDA is to apply our regulations under a balanced, risk-based framework," Gottlieb said at the 2018 Health Datapalooza conference Thursday. Products that fall under this regulatory framework would include mobile devices and software that ensure medication adherence or software that helps cancer patients monitor treatment side effects by using smartphone cameras and facial recognition software to classify pain symptoms and track cognitive performance. The Clinical Decision Support Coalition and other groups have estimated that patients with chronic conditions adhere only to 50% to 60% of medications as prescribed despite evidence that medical therapy prevents death and improves quality of life. The coalition is made up of software companies, healthcare providers and IT infrastructure, medical-device and pharmaceutical manufacturers. It sent the FDA a citizen petition in 2016 calling for a regulatory standards outline for the products. "FDA's current guidance does not provide answers to basic questions about digital health products used with pharmaceuticals, including under what circumstances, the software and the wearables might constitute medical devices, and under what circumstances, if they are medical devices," the petition said. While the coalition declined to comment on Gottlieb's announcement, others said the move could speed up product development. "A potential FDA stamp of approval certifying the evidence basis and safety of a digital health tool, could lead to faster provider and payer adoption," said Dr. Dan Gebremedhin, a principal at a healthcare-focused venture capital firm in Boston. The regulatory pathway could also lead to better care for patients, according to others in the industry. "Clinicians and health systems are often hesitant to use these tools without knowing their validity and limitations," said Ryan Shaw, an associate professor at the Duke University School of Nursing who follows mobile health trends. "The FDA's move to regulate digital health tools will help accelerate their use in care delivery." In the coming weeks, Gottlieb said the FDA will solicit public comments on how to best move forward. That feedback will be critical in helping the agency establish some bright lines between what's regulated and what's not, and best practices for ensuring the tools are accurate and gather meaningful data, said Nathan Cortez, a law professor at Southern Methodist University who studies the regulation of emerging health trends. Greater regulation for these products could also result in greater use of them in drug clinical trials. Gottlieb mentioned these tools might help support drug companies' safety and efficacy claims for the products they are developing.